VENICE — Like so much in downtown Venice this summer, plans to move the Venice Farmers Market from its current home on Tampa Avenue to Avenue des Parques near City Hall hinge on when the downtown street reconstruction project begins. “We’re in the process of identifying which Saturday, which week would be the best for us to make the move,” said Lee Perron, who managesthe market on behalf of the Friends of Sarasota County Parks. A recent cover photo from the Venice Farmers Market Facebook page. 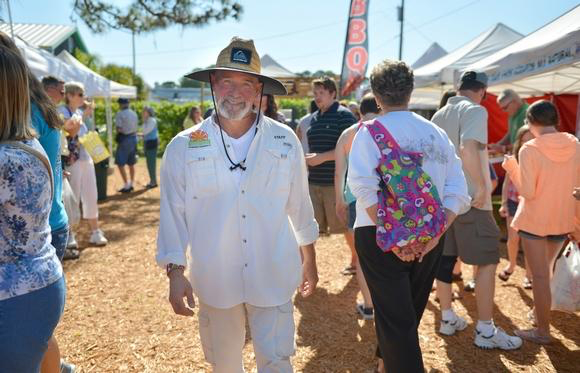 Lee Perron, who manages the market on behalf of the Friends of Sarasota County Parks, anticipates moving the market from the 200 block of Tampa Avenue to Avenue des Parques near City Hall in the latter half of June. Meanwhile the Venice City Council finally defined the scope of work on the $8.3 million reconstruction of Venice, Tampa and Miami avenues at its May 22 meeting. A timetable should be set at a preconstruction meeting Tuesday, though City Engineer Kathleen Weeden said actual street closings may not happen until the week of July 9. Depending on how things go, Perron anticipates moving the market from the 200 block of Tampa Avenue in the latter half of June. Off-season hours started in May, so the market will be open from 8 a.m. to noon through December. Perron and the Friends of Sarasota County Parks took over operation of the market last July, following the retirement of longtime market manager Linda Wilson. The past year the market grew to feature as many as 50 vendors, offering a variety of food and wares — including baked goods, international foods and a cheese monger. Perron said that customer volume at the market grew about 30 percent this past season. In 2016, the market’s high volume was about 3,200 people per week. In March, the average was 5,000 people per week. After season, the number of vendors traditionally decreases, but this year 45 vendors plan to stay on through the summer. The hope is that fewer Venice residents will trek up to downtown Sarasota for their fresh produce needs, because the local market will offer plenty of variety. “They’re going to have all the choices that they want right there in the city,” Perron said.